St. Paul, Minn., March 28, 2018 – PolyMet Mining Corp (“PolyMet” or the “company”) TSX: POM; NYSE MKT: PLM – today reported that it has filed its financial results for the eleven months ended December 31, 2017. PolyMet controls 100 percent of the development-stage NorthMet copper-nickel-precious metals ore-body and the nearby Erie Plant, located near Hoyt Lakes in the established mining district of the Mesabi Iron Range in northeastern Minnesota. In January 2017, the United States Forest Service issued its Final Record of Decision authorizing a land exchange to transfer title of the surface rights over and around the NorthMet mineral rights to PolyMet in exchange for certain other lands owned by PolyMet. In August 2017 and September, the Minnesota Department of Natural Resources released six draft water appropriation permits and two draft dam safety permits for 30-days of public review and comment which have all closed. In September 2017, the company issued and committed to issue to Glencore secured debentures with a total principal amount of $20 million. In October 2017, the company entered into an agreement with EIP Credit Co., LLC to reserve wetland bank credits for the NorthMet Project. In November 2017, the U.S. House of Representatives approved bipartisan legislation introduced by Rep. Rick Nolan, D-MN-8 to ratify the previously approved land exchange between PolyMet and the U.S. Forest Service. This bill was advanced to the U.S. Senate for consideration. In December 2017, the Board of Directors approved a change to the year end from January 31 to December 31 resulting in an eleven month transition year. In January 2018, the MDNR released the draft Permit to Mine and the Minnesota Pollution Control Agency released the draft water quality permit, draft section 401 certification, and draft air emissions permit. The public review and comment periods for these draft permits, including final public hearings, have all been completed. In March 2018, the company and Glencore agreed to extend the term of outstanding debentures until March 31, 2019, reduce the interest rate on the outstanding debentures, and make available $80 million in additional debentures during 2018. Proceeds will be used to complete pre- and post-permitting work, including detailed engineering, environmental cleanup and purchasing wetland credits. In March 2018, the company issued an Updated Technical Report under NI 43-101 incorporating process improvements, project improvements and environmental controls described in the Final Environmental Impact Statement and draft permits. The update also included detailed production, capital, operating and valuation estimates as well as an assessment of potential future opportunities. 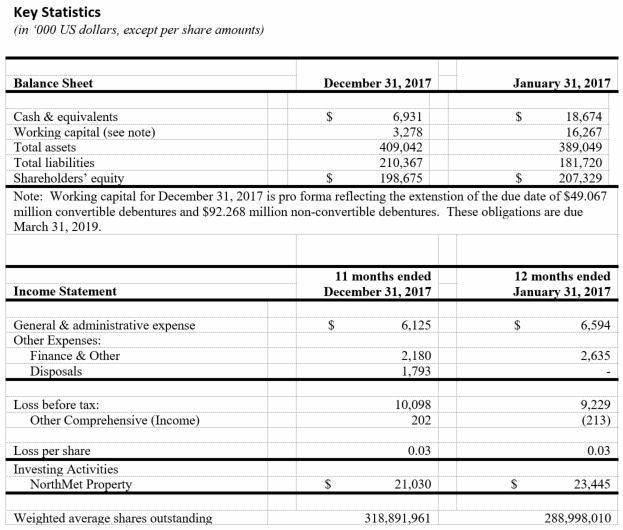 Loss for the eleven months ended December 31, 2017, was $10.1 million compared with $9.2 million for the prior year period. Excluding non-cash compensation, general and administrative expenses for the eleven months ended December 31, 2017, were $4.8 million compared with $4.8 million for the prior year period. PolyMet invested $21.0 million cash into its NorthMet Project during the eleven months ended December 31, 2017, compared with $23.4 million in the prior year period. At December 31, 2017, PolyMet had cash of $6.9 million compared with $18.7 million at January 31, 2017. Favorable decision by the state on 401 Water Quality Certification and U.S. Army Corps of Engineers Final ROD and 404 wetlands permit under Clean Water Act. Favorable decisions on final state permits (Permit to Mine, air, water and dam safety permits). Completion of construction finance plan, subject to typical conditions precedent such as receipt of key permits.